Figuring out how to travel with pets can be a little tricky (and expensive) but a little planning goes a long way! These tips will make traveling with your pets so much easier and budget-friendly! This post is sponsored by Extended Stay America. All opinions are my own. For more information, see my Disclosure Policy. Last month, I traveled to New York for my brother’s fiancee’s bridal shower and for a girl’s weekend with my best friend. It was a total blast, and while we were there, my mom was picking up her new puppy Oscar from the breeder in Buffalo. 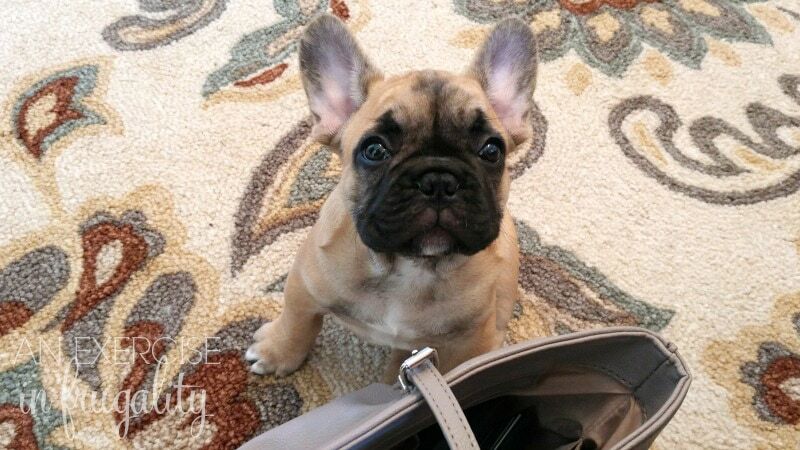 Oscar is my new “fur brother” pictured above, isn’t he the cutest? Anyway, figuring out how to travel with pets on a budget can be complicated, stressful (for you and your pet) as well as expensive if you’re not careful. 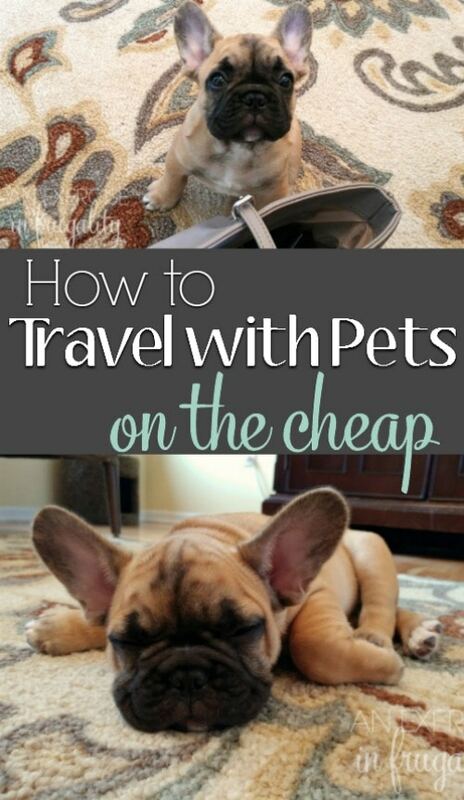 In the spirit of my new fur brother, I wanted to share with you some tips on how to travel with pets on a budget. When traveling, the last thing most people want to do is leave their pets behind. Many people think that traveling with their pet is expensive, but in reality, with a little preparation and planning it is actually often cheaper to bring your pet than it is to leave them with a pet sitter. 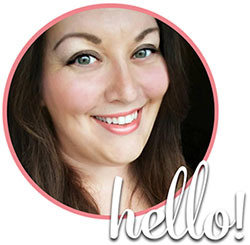 And if you’ve been around a while, you might remember my pet sitter horror story so you’ll understand why I prefer to bring our pets whenever it’s feasible to do so. Oscar is quite the model isn’t he? 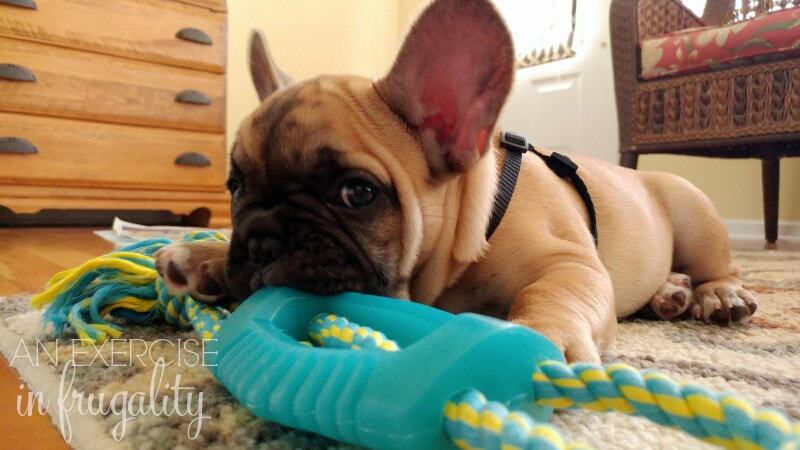 We are totally smitten with this little guy, and he is a complete love bug. And since my father has flight benefits as a retired airline employee, Oscar is going to be a dog that travels A LOT as he gets older. We have traveled with our pets (dog and cat) many times, including 3 cross-country moves. Each time presented it’s own challenges and expenses so I wanted to share some budget-friendly tips AND a bit about our new favorite pet-friendly hotel chain. What do you need to prepare your pet for travel? Anything you might need for your pet from food to treats, poop bags to medications make sure you have it in advance. You never know when you’re going to need them, and you might not be somewhere that they are available and if they are available, you’re at the mercy of whatever the prices are. We make sure to have cat litter and disposable litter trays as well as more than enough of Loki’s prescription medications, plus Bear and Loki’s food. They eat specialty foods that we have found good prices on at places near us, but if we have to shop elsewhere we may either not be able to find them, or wind up spending a fortune on food when we already have some at home. Pets will panic when in unfamiliar places. The last thing you want is to open Fido’s carrier and have him bolt, but what happens if you have no identification or chip? Make sure your pet has proper identification so if they freak out and run, you can be sure to get them home safe. Don’t forget to check with their vet to be sure they are up to date on things like shots, heartworm meds, flea and tick preventatives, etc. If you are traveling by airline, they may require documentation from your vet so be sure to have this done in advance or they could refuse your pet passage (thus costing you in fees to change your tickets or worse, cancelling your trip altogether!). If you’re traveling by car, this is still important because you never know what your pet will come in contact with at rest stops, hotels or your destination. Is an over the counter sedative safe for dogs and cats? A simple phone call to ask about dosing your pet with Benadryl or a prescription sedative could save a costly vet visit if you get the dose wrong. Before trusting random internet dose guidelines, make a quick call to your vet if you plan to give your pet a mild sedative before your trip. While you’re on the phone remember to ask if your pet is up to date on vaccinations and ok to travel long distances. What is the airline pet policy? Some airlines are more pet-friendly than others. Make sure you check (and double check) before booking your ticket and flying with a dog. And don’t you dare go buying one of those fake service animal vests for your dog. Service animals are a necessity for many people. Don’t be the jerk who fakes it. Not only is that an incredibly stupid thing to do, but you’re putting yourself, your pet and other people at risk. Just don’t do it, mmkay? PLEASE NOTE: This is a list of current airline pet policies as of June 2018. I will do my best to keep this list up to date, but I’m not responsible for your pet so make sure you check with the airline to verify the accuracy of this information! Delta Airlines Pet Policy: Cabin and cargo compartment, requires health certification from veterinarian. Read the full policy here. United Airlines Pet Policy: Cabin and PetSafe® pet transport with climate controlled, pressurized compartments. Read the full policy here. American Airlines Pet Policy: Cabin and cargo compartment subject to availability. Breed and destination restrictions apply. Read the full policy here. Alaska Airlines Pet Policy: Cabin and cargo compartment subject to availability. Breed restrictions apply. Read the full policy here. Sun Country Airlines Pet Policy: Cabin in carry on luggage conditionally. Read the full policy here. Southwest Airlines Pet Policy: Cabin in carry on luggage, domestic only, limit 6 pets total per flight. No cargo passage. Read the full policy here. British Airways Pet Policy: Service animals only in cabin, all others (including emotional support) cargo only. Read the full policy here. Frontier Airlines Pet Policy: Cabin only in travel carrier. Restrictions apply, no cargo. Read the full policy here. Spirit Airlines Pet Policy: Small pets/dogs cabin only. Restrictions apply, domestic flights only. Read the full policy here. Are there pet friendly hotels near me? Chances are, YES! We have stayed at many hotels during our travels. Not all hotels are pet friendly and not all ROOMS are pet friendly. Be sure you check with your hotel BEFORE you book so that you’re not stuck paying huge cleaning fees for unauthorized pets. 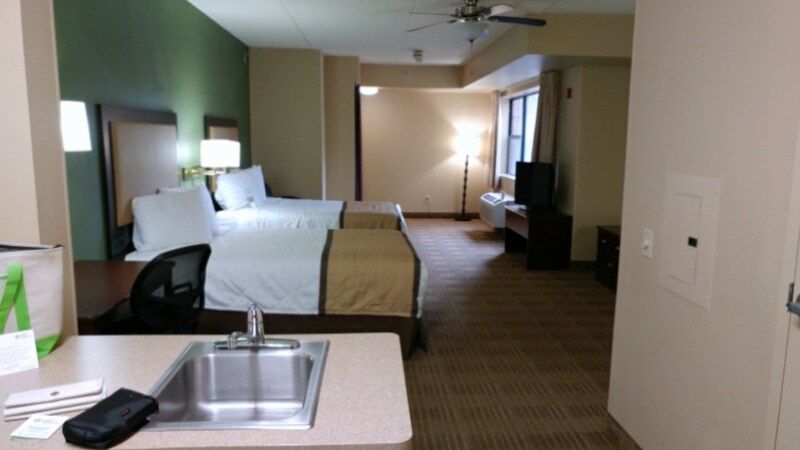 For my New York trip, I stayed with Extended Stay America at their Bethpage, New York location. I had never stayed at an Extended Stay before, and I will sheepishly admit I thought they only did extended stays and not one or two nights. WRONG! I love that Extended Stay hotels are pet friendly and affordable. The room was HUGE, clean and it has it’s own kitchen, which is perfect for feeding your pets, cooking your own meals (which keeps travel cheap!) and a fridge to store your beverages or refrigerated medications. These are my tips to travel with pets on a budget. A special thank you to Extended Stay America for providing me with a room while I was in town. There are definitely going to be many more ESA hotel stays in my future, especially when I travel with my boys Bear and Loki. So many places don’t welcome pets, so it’s a relief to find a quality hotel chain that does. How do YOU travel with pets on a budget?